Ed with Steve and Nancy in their beautiful backyard. 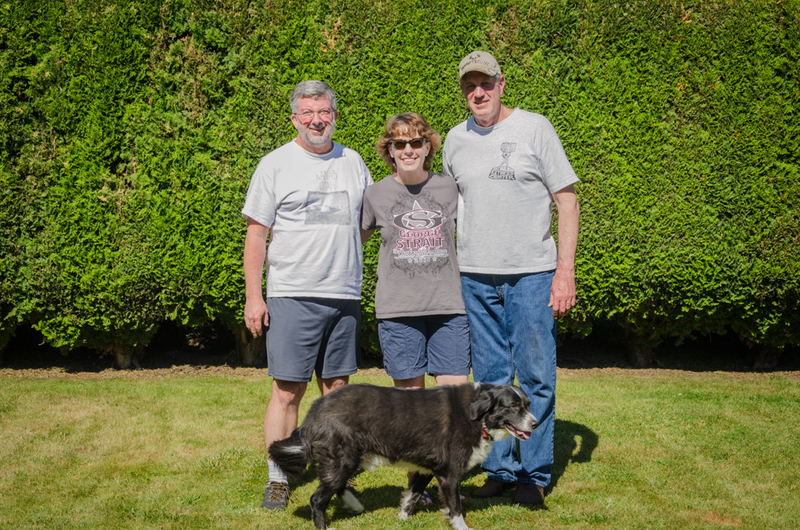 I have been enjoying my stay in Enumclaw and Saturday was especially great. Steve sent me a text in the morning and invited me to join him on a hike up Pinnacle Peak. It was beautiful and cool, so it was especially nice to be outside walking. Afterwards, Steve dropped me off at our motorhome and I caught up on emails and had lunch. In the afternoon, Nancy and Steve graciously allowed me to use their washer and dryer (without a sewer hookup in our RV park, I cannot use our washer). However, the highlight of the day was the wonderful meal we enjoyed together for dinner! Nancy prepared a great marinade using a recipe provided by a friend in Alaska and Steve cooked salmon on their barbeque grill in the backyard. It was absolutely fantastic! I could not stop eating the salmon. I took notes, but I do not think I will be able to match their salmon cooking expertise.